Convergence onto a common network is a cost-efficient strategy, but there are physical and network-centric hurdles to jump. Retrofit is a word that invokes spirited discussions in the systems integration world. The ratio of seamless projects to headache-inducers unfortunately skews toward the latter. Those headaches can be significantly reduced, however, with the appropriate strategy. The overarching trend of the A/V and IT marriage touches many who work in technology today, with many businesses working to migrate multiple operations onto a common network. Digital signage is one such example. As with other A/V technologies, the integration of digital signage into an existing network infrastructure starts with the supporting “nuts and bolts,” from wiring and cabling to power management and availability. Network capacity is also crucial, as traffic overload from newly integrated components will cause frustration across multiple departments. However, it is reasonable to say that digital signage requires a far more in-depth study in advance of integration than, for example, an audio stream. There are significant challenges to cleanly pushing video around facilities, while retaining exceptional quality that consumers will want to watch. Furthermore, the presence of digital signage content on an existing network requires significant thought depending on the vertical application. For example, how can you effectively share bandwidth with business transactions and other data-centric traffic in a retail store or entertainment venue? And how do you prioritize for “on the fly” content changes, especially when advertising is in the mix? Collectively, the strategy also requires intensive planning to accurately gauge deployment costs and timelines, especially for projects that span multiple facilities and geographical locations. Put simply, there is a lot to consider. It may seem obvious to state the importance of physical architecture, but the reliable transport of high-quality digital signage content is impossible without the proper support. At present, Harris, an installer of digital out-of-home solutions, is hard at work on a retail network upgrade that spans hundreds of locations. The previous architecture primarily focused on audio, with overhead radio delivering music and advertising to shoppers. The migration to video required a comprehensive cabling and wiring upgrade to push four channels of HD content to many screens. The decision to add HDMI cabling was easy enough to provide the quality needed; however, distance to the screens proved challenging. HDMI cables have no official transport distance limit, though signal degradation begins at approximately 30 feet. This is fine if you co-locate the media player at the screen, but in most cases only single-channel players are installed in this manner. This particular project required a series of quad-channel players—pushing three video channels and one audio channel, from a central equipment space. While the strategy reduced media player costs, it also created player-to-screen distances of between 400 to 600 feet—far greater than what a straight HDMI connection can reasonably carry. The technical solution in this case is quite simple: Add a series of extenders and/or repeaters to push high-quality signals over long lengths. However, building structure can and usually does impede on sightlines for cable runs, requiring extensive drilling and trenching to run wires from the back office to the screens. This can quickly escalate project expenses for the client. In such cases, a change in strategy regarding player distribution—one per screen—is perhaps the better decision for cost-containment. This puts the player closer to an IT network drop, simplifying cable runs and eliminating the logistical headaches of chiseling through floors, walls and ceilings—and simultaneously keeping integration costs in check. No one likes a traffic jam, whether stuck on the Washington, D.C., beltway or fighting through a congested IT network. In the digital signage universe, the majority of content is transported via IP networks. Satellite remains an option, though satellite distribution is increasingly converging with IP to create a more efficient hybrid network. There is one common mistake among the various transport methods: lack of knowledge regarding capacity and how to best utilize available bandwidth. And perhaps the most bandwidth-challenged projects Harris comes across are in the retail environment. Harris currently operates a large retail network where digital signage is assigned a priority level below point of sale traffic, including credit card transactions. This makes pushing HD content to multiple locations especially challenging on heavy transactional days. For example, content in the 4 to 5 GB range can take up to 24 hours to arrive. This is extremely problematic in situations where content is often refreshed. Content scheduled a day or more in advance is typically unaffected, but dynamic networks that require on-the-fly changes for news and day-parting activities can be adversely distressed. The risk of showing outdated content escalates if new updates are stuck in traffic from bandwidth constraints. And the challenges intensify for ad-supported networks, as insertion orders often arrive with little notice. How do you ensure that new advertisements appear on the network on short notice if the network is congested? Installation of a separate private network is one alternative, but the costs of this usually outweigh reality. 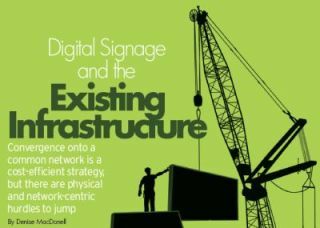 Most businesses will choose to integrate digital signage traffic into the existing network, which means the vendor and, when relevant, systems integrator must be prepared for the consequences. Harris is introducing new bandwidth and content management analysis tools to determine how much bandwidth is required to push HD content to screens across multiple buildings and geographical locations. These tools produce calculations to provide upfront analysis on content, file sizes, downloads and delivery times, among other concerns. Understanding these variables will paint a clear picture on amount of content and how it affects bandwidth usage. Ultimately, tools such as these help businesses with digital signage networks better manage expectations and understand how traffic is flowing across their pipes.